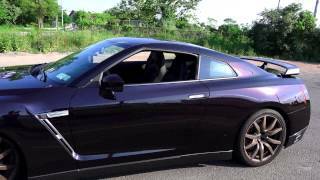 Nissan has unveiled a new special edition GT-R, called the 2014 Nissan GT-R Midnight Opal, which gets its name from the Midnight Opal color scheme applied to its exterior. The special edition will be limited to just 100 units for worldwide consumption in which half of the units will be available in U.S. The Midnight Opal exterior paint is applied with each coat applied by hand. The highly reflective paint treatment changes appearance slightly from a deep purple to a deep blue depending on light conditions and viewing angle. 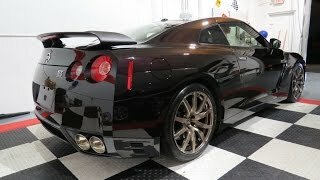 The Special Edition GT-R Midnight Opal also features a dry carbon fiber rear spoiler, RAYS forged aluminum wheels with a “hyper-titanium” coating and gold-plated serialized plaque of authenticity located in the engine compartment. The interior features sculpted performance bucket seats and a cockpit-style instrument panel with a large center-mounted tachometer and multi-function display. The Special Edition GT-R is powered by Nissan's advanced VR38DETT 3.8-liter twin turbo V6 engine rated at 545 hp and 463 lb-ft of torque. It uses the dynamic independent rear transaxle ATTESA E-TS all-wheel drive system. 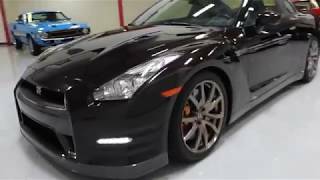 The 2014 Nissan GT-R is also available in GT-R Premium, GT-R Black Edition and limited production 2-seat GT-R Track Edition. The Special Edition will cost $106,590, a $6,000 more than the GT-R Premium Editon and goes in sale in September.